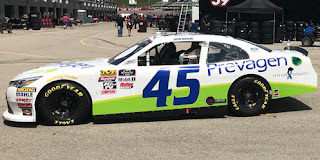 Josh Bilicki picked up the 2nd last-place finish of his NASCAR XFINITY Series career in Saturday’s U.S. Cellular 250 at the Iowa Speedway when his #45 Prevagen Toyota fell out with engine trouble after 2 of the race’s 257 laps. 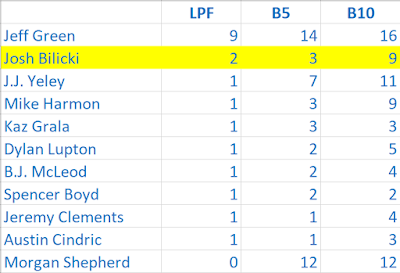 The finish, which came in Bilicki’s 26th series start, was his second of the year, his first since Daytona, three races ago. In the XFINITY Series last-place rankings, it’s the 12th for car #45, the 119th for Toyota, and the 254th due to engine trouble. Across NASCAR’s top three series, it’s the 36th for the #45, the 298th for Toyota, and the 1,060th because of engine trouble. Following his difficult night in Daytona, Bilicki finished 28th at Kentucky, then had ignition issues at Loudon, dropping him to 34th. In that time, his sponsorship from Prevagen spread to his JP Motorsports teammate in the #55. That car carried a blue scheme while Bilicki ran a white car. Bilicki and his new teammate, a returning Peter Shepherd III, would run these schemes at Iowa. 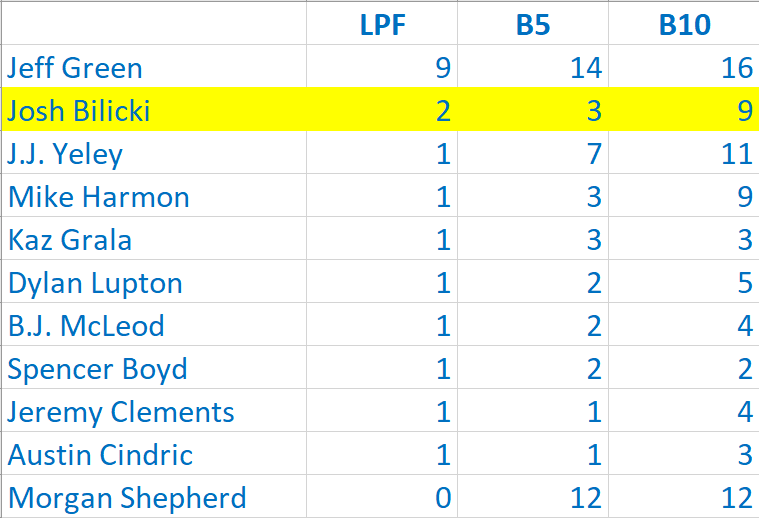 Bilicki didn’t run the opening practice session and ranked 33rd of 37 drivers in Happy Hour. He then tweeted that the team was running used tires for qualifying, which accounted for a modest lap of 123.042mph (25.601 seconds), the slowest completed circuit that afternoon. Bilicki then mentioned that the team discovered an engine issue in Round 1, a “high rpm misfire” that was either fuel or electrical related. As the rest of the field lined up for the race, the JP Motorsports crew was under the hood of the #45, trying to diagnose the problem. Starting last Saturday was Dexter Bean, back on the circuit for the first time since last fall at Kentucky. Then, as on Saturday, Bean drove Mario Gosselin’s second car from DGM Racing, a car that hadn’t even been entered since last fall at Charlotte. Bean turned only two laps prior to qualifying, both in Happy Hour, and was slowest in that session. In qualifying, he outpaced four other cars – including Stephen Leicht, who didn’t make an attempt in Round 1 – but was still ranked last as the #92 had no previous attempts in 2018. Bilicki joined Bean at the back of the field. The last-minute look under the hood by the JP team meant the #45 was the only driver penalized before the start. Unfortunately, the repairs didn’t take. After steadily losing ground on the start, dropping 18 seconds back of the lead and 7 behind the 39th-place car, Bilicki pulled behind the wall after just two laps, done for the day with engine woes. Finishing 39th was Stephen Leicht, who late in the week was appointed to drive Jeff Green’s #93 RSS Racing Chevrolet when Green was moved to the #38. Leicht started 39th after not turning a qualifying lap and worked his way up to 33rd in the first 19 circuits, fending off the leaders to stay on the lead lap before the race’s first caution. The Lucky Dog for that yellow went to 38th-place finisher Morgan Shepherd, who qualified on time in 33rd and briefly put his #89 Visone RV Chevrolet on pole in the opening seconds of Round 1. The 37th spot fell to Chad Finchum, whose composite bodied #40 MBM Motorsports Toyota caught fire on the backstretch during the yellow at the end of Stage 1. Brake issues were the officially-listed cause of his retirement. Bean rounded out the group, completing 73 laps in the Gosselin car before citing a vibration. *This marked the first last-place finish for both Bilicki and the #45 in an XFINITY Series race at Iowa. *Bilicki is the first XFINITY Series driver to finish last at Iowa because of engine trouble.